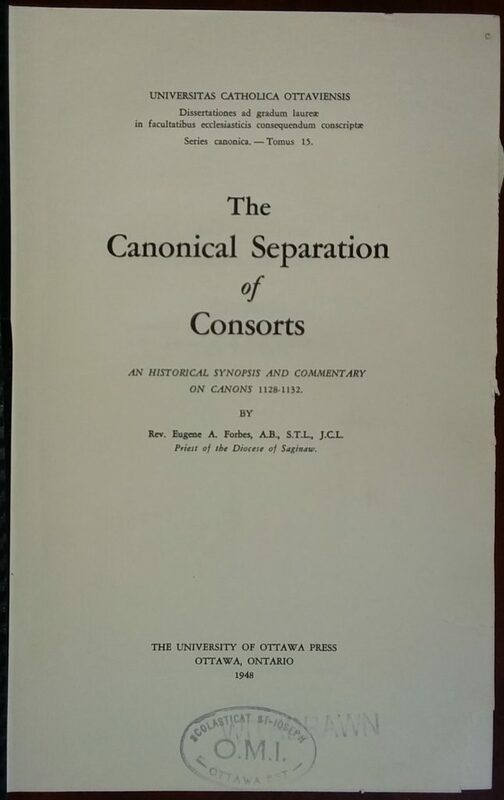 Canonical Separation of Consorts: An Historical Synopsis and Commentary on Canons 1128-2232. Ottawa: The University of Ottawa Press, 1948. Page 151: serious quarrels do not make the right for separation and divorce, but could be reason for censure and correction. Page 179: Rota judge takes to task modern theologians for lax stance. M. are C. aviait epose. il y a neuf ans, une Demoiselle D. Trois enfants sont issus de ce mariage. Malheureusement, la femme tint bientot une conduite seandaleuse. Elle quitta son mari d’une de ses relations adulteres naquit un enfant, qu’elle essaya de dissimuler. Durant sa grossesse, elle rentra meme momentanément sous le meme toit qui son mari, afin de rendre impossible a celui-ci une action em repudiation de paternite. Pour pouvoir répudier cette paternité, pur empêcher l’introduction de nouveaux batards dans sa famille et sauvegarder ses omterets de frptime et ceux de ses trios enfants, le mari, vu l’état de la legislation civile, n’a d’autre moyen efficace que de demander le divorce civil. Cependant, comme il est reverent catholique, il n’entend pas que cette rupture du lien purement civil, soit considérée comme une lesion du lien religieux qui l’unit a sa malheureuse femme. Ainse sa pensée n’est-elle nullement de paraitre redevenir libre de contracter une nouvelle union, mais seulement d’user des moyens que lue donne la legislation en vigueur pour s’assurer une entière separation de vie, de corps et de biens d’avec sa famille et notamment de ses enfants. Dans ces conditions, il demande s’il lui est licite d’engager une action en divorce civil contra sa femme? Sacra Poenitentaria ad premiss respondet: Non licere. Datum Roman in S. Poenitentiaria die 7 January 1892. There’s this lady who is married and has 3 children with her husband. She leaves her husband and conceives a baby in an adulterous union. Then, she returns to her husband in order to claim that it’s her husband’s baby. But the husband finds out about it, and in order to protect his other three children, he intends to get a civil divorce, but he’s a good Catholic so he understands that by this divorce the sacramental bond between them will not be ruptured, but there will only be separation of state of life, bed and board and so forth. So, they ask if it’s allowed for him to request a divorce. And the Sacred Penitentiary says no, so the wife might repent, he must not request a civil divorce, and to do so would be a grave sin.
. These other grounds are extrinsic to the nature of marriage, and do not directly contradict its nature as adultery does. There is less evil in them, and their effects, therefore, are commensurate with the causes themselves. The ius coniugale is not lost by them, but only its exercise for a time. Their effect is only temporary, so that, when the cause ceases, the right of separation ceases also. If a spouse has separated proproa auctioritate on any of these grounds when the reason for separation is certain and there is danger in delay, he is bound to restore marital life on cessation of the grounds.
. The Canon, however, tempers with equity the last sentence of Pope Urban’s decision above: “Si vero iudicio ecclesiee ab eo sine spe matrimonii redintegrandi recessit, ad ‘recipiendum elan nullatenus earn dicimus compellendarn.” If the Ordinary has fixed a time limit to the separation, eo elapso, conjugal life is to be restored, unless the separation has been prorogued by the Ordinary. If the sentence or decree of the Ordinary conceded separation “until the cause ceases,” then the separation must cease upon cessation of the grounds. If the innocent party is unwilling to return, he sins, and the other partner can seek the intervention of the Ordinary to verify the cessation of the grounds and to enforce reconciliation. If the Ordinary has fixed a time limit to the separation, say three months, on its expiration community of marital life is to be restored, and the recalcitrant party sins in refusing reconciliation. If the Ordinary has granted separation ad tern pus indefiniturn, the innocent party cannot be forced to return on cessation of the cause, but only by a new decree of the Ordinary. In any case, the innocent spouse should not be compelled to restore conjugal community unless the guilty party gives sure signs of amendment and sufficient guarantee of security for his spouse. Pages 243-244: The silence of the code forces the conclusion that illegitimate separation is not a delict in the strict sense of the law, because no canonical sanction saltem indeterminata has been attached to it. It cannot, then, be grounds for criminal prosecution against the guilty party. The Ordinary, however, can protect and enforce the rights of the innocent party, victim of illegitimate abandonment by the other, with the judicial or administrative sanctions. […] For principles concerning the nature and gravity of the sin committed by consorts who separate illegitimately as regards cohabitation, the reader is referred to writings of moral theologians” [Forbes cites Prummer, Merkelback, Noldin, Genicot, Lehmkuhl, Sabetti-Barrett].